I’ve always felt like a bit of a traditional Easter outsider. When other kids were joyously contemplating baskets filled with candy and fake grass, I was coveting their Cadbury eggs and was waiting impatiently for my Easter to roll around. My family went to a Russian Orthodox church. In the Russian Orthodox tradition, celebrations are plotted using the old Julian calendar rather than the standard Gregorian calendar used by most people in the modern world. 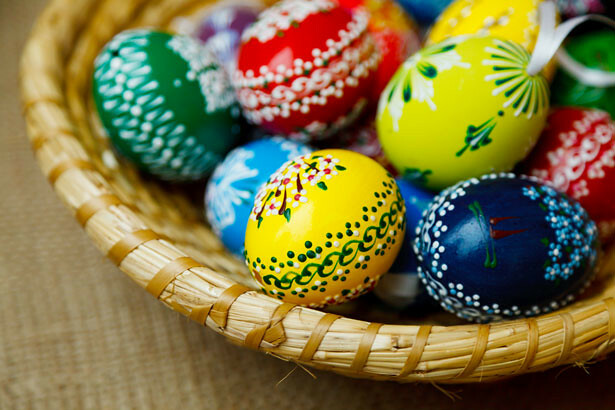 This means that Easter for those of the Eastern Orthodox faith can occur up to five weeks after most Christian denominations. Sometimes the two Easters coincide, but usually Orthodox Easter, or Pascha, lags behind in old-world style. This year it’s only a week behind everyone else, on April 12. Most Americans celebrate Easter at a reasonable hour on Sunday. The Russians do not. After seven weeks of abstaining from meat, dairy, and other food groups for what’s known as the Great Lent, they waste no time getting their holy revelry on. We would arrive at the church around 10:30 p.m. on Saturday to help with preparations, and then the church service would begin at midnight. People would cram inside, squeezing around numerous mounds of candy-colored eggs and other Lent-forbidden foods the priest would flick with holy water, singing and chanting with the choir into the wee hours. The entire congregation would circle the church several times in an animated procession that felt to me like a candle-lit death march, but it didn’t end there. If they were still conscious after the hours-long service, parishioners would head to the great hall to feast on meat-infused dishes. Some intrepid souls might even attend the 9 a.m. service. When I was about five, I finally passed out in a crumpled heap. There were no pews in the church, so the floor was the only place to go. My mother carried me to the altar for Communion, then on to the feast afterward, leaving me on a sofa. I awoke briefly on the car ride home in time to see the sun rising before I collapsed on my bed. My abrupt slumber was not unusual. In fact, it was somewhat common to see people falling asleep despite the ecclesiastical thunder that surrounded them. Grim Russian forbearance kept most attendees upright, but the children and the elderly, weakened from hunger and fatigue, and unable to muster the energy to stand any longer, would drop like flies as time progressed. Alas, the Blessed Sabbath pauses for no mortal. I’m not sure I would fare any better these days. Although I haven’t been to a service in years, my family still celebrates Pascha with food and candy. We dye eggs, eat some ham, and generally have a good time. It’s not high church, but it works for me. However and wherever you choose to spend this Easter Sunday, may you be safe, happy, and mostly lucid.